One of my major pet peeves about Windoze Ten is the update process. You cannot override the update process. You cannot disable the updates. Updates can wreck the OS. It may choose to do a full reinstall in the middle of the day. It can take up to 4 hours to get your computer back up and running after an update. Your computer will reboot unceremoniously during this process and you WILL lose any unsaved work. 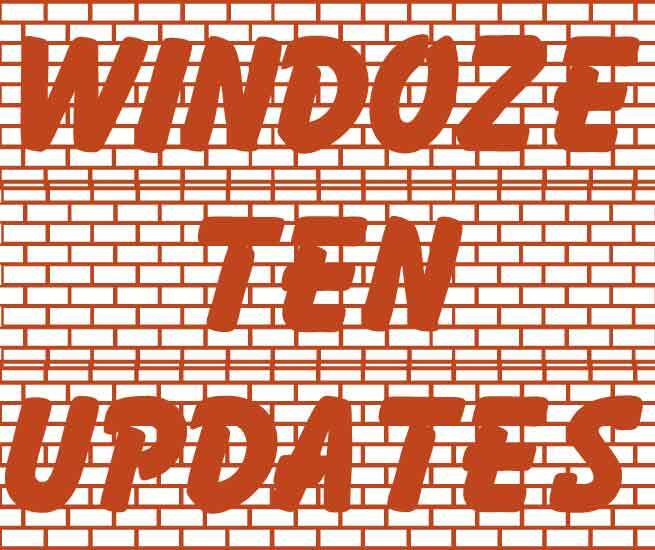 So far, in the life of Windoze Ten, there have been two major “updates” that were actually not updates. They were (and are) complete re-installs of Windows 10. This frequently results in a bricked computer (useful only as a doorstop). The first was the “Anniversary Update” that rolled out between August 2, 2016 and around the end of November 2016. This was a complete re-install of Windows and caused a fair number of computers to stop functioning correctly – or simply not function at all. The second Trojan Horse “update” is the currently deploying “Creator Studio Update” that also completely re-installs Windows, leaving many computers with no Internet connection and frequently unable to print. The reason for this behavior is interesting. It appears the reinstall trashes any 3rd party security / antivirus product’s firewall. This kills the Internet connection. Generally, you have to remove and completely reinstall the software to fix the problem. In many cases, this is incredibly complicated – or just doesn’t work at all. A solution is to roll back the OS to a previously functional point in time. However… The first chance Windows 10 gets to do the update again – it will most likely suffer the same consequences. Provided the hardware is decent (at least an Intel i5 at 2.5 GHz or better and at least 8 GB Ram) you can rip out Windoze Ten by its guts and replace it with Windows 7 Professional. I have done this many times and the difference is like night and day. You will have a computer that is F.A.S.T. – it will be stable – and you have total control of the update process. I disable the automatic updates and place a Windows Update shortcut on the desktop. Periodically you should check available updates and ONLY install security updates. Anything else has the potential for wrecking an otherwise well functioning computer. In my personal opinion, Windoze Ten is just another Windows Vista with the exception that Micro$oft won’t own up to it. Why there is still no class action suit is a mystery. The number of people who have been rendered out of business due to these buggy updates is astronomical. The cost to the average user for getting a Computer Wizard like myself to unscramble the resulting mess is in the hundreds of dollars per event. If you have been hammered by a Windoze Ten update and need your data recovered and system reconstructed, give me a call. 214-232-9503 at any reasonable hour.